The system is growing exponentially and there’s no anchor. People believe governments will be saved by central banks. The problem is now too big for central banks to fix. It’s an inverted pyramid of promises poised on a small sliver of real money called gold. The pyramid is bound to tip over and crash as it has many times in the past, from the Jubilees of ancient Israel to the global financial crisis of 2008. For years, financial analysts have discussed a Global Monetary Reset (GMR) because the whole world’s system is unstable and unsustainable. The 2008 panic would have closed banks and capital markets around the world but central bank intervention created tens of trillions of dollars to save it. All of that bailout money they printed still hasn’t been fixed. Things didn’t go back. It sowed the seeds of the next crisis. A new system will have to be made. It will be based on a mix of U.S. dollars, gold, the IMF’s world money called special drawing rights (SDRs), and maybe an encrypted distributed ledger (blockchain). It might revert to fixed exchange rates instead of the current floating system. The Reset would be a return to something like the old Bretton Woods system (1944–1973) but with 21st-century characteristics and technology. This is what is meant by the Global Monetary Reset. It will happen. The big questions are how and when? In a proactive way before a crisis hits, by holding a conference like Bretton Woods (1944), the Plaza Accord (1985) or the Louvre Accord (1987). In a chaotic fashion in response to a new financial crisis, like the G-20 Washington summit led by George Bush and Nicolas Sarközy in Nov. 2008. Jim has always believed the Global Monetary Reset will happen in a panic because of a lack of leadership and foresight of the global monetary elites. There will be a new international monetary system where the U.S. dollar isn’t the world’s leading reserve currency. This is a cross-rate of USD/GLD. Economists also track the price of the two largest economies – the U.S. dollar and the Chinese yuan – against each other. The U.S. and China combine to produce almost 40% of global GDP. What happens with the Chinese currency is very important to the world economy. China did a shock devaluation of the yuan in Aug. 2015 and the U.S. stock markets fell 11% in three weeks. The Fed intervened by delaying their interest rate hikes from Sept.–Dec. 2015. China devalued again in Dec. 2015, and U.S. stocks fell 11% again from Jan. 1 to Feb. 10, 2016. It took the G-20 Shanghai Accord in late Feb. 2016 to put an end to Chinese shock devaluations. The International Monetary Fund (IMF) publishes the price of their SDR, world money, in USD. So we have USD/GLD, USD/CNY, and SDR/USD. If A = B and B = C, then A also = C.
D. H. Bauer created a report that followed gold prices in SDRs instead of USD and found something very unusual and unnatural. The IMF only issues SDRs to member countries, and they’re traded among the members through a secret trading desk inside the IMF. The SDR is valued using a “basket” of currencies – US. dollars, pounds sterling, euros, Japanese yen, and as of Oct. 1, 2016, the Chinese yuan. Before China joined the SDR: the U.S. dollar price of gold and the SDR price of gold were volatile. After China joined the SDR: the U.S. dollar price of gold continued to be volatile, but the SDR price of gold was much less volatility, especially after the first few months. Most importantly, the trend line of SDR/GLD became a near-perfect horizontal line. The odds of this happening randomly are infinitesimal. In short, world money has now been pegged to gold at a rate of SDR900 = 1 ounce of gold. It’s a new gold standard using the IMF’s world money. There’s the Global Monetary Reset right in front of your eyes. Why did SDR/GLD go from normal volatility to no volatility overnight? The straight-line behavior of SDR/GLD after the Chinese yuan joined the SDR is impossible without some kind of intervention or manipulation. The SDR/GLD horizontal trend line after CNY joined the basket is too steady and consistent to be real. It’s either a “feedback loop” (can’t be because it’s a relatively free market of supply and demand), or it’s random (statistically impossible), or maybe fraud, (can’t be because the data is from public sources), or else it’s manipulated. The first three options are ruled out which leaves manipulation as the only possible explanation. To peg any cross-rate you need a large floating supply of both components or else a printing press to make as much as you need. In this case you would need a large liquid supply of gold and SDRs. If the gold rises above SDR900 (priced in SDRs), you sell some gold and buy SDRs (or the currency basket in the same ratio). If the SDR price of gold sinks below SDR900, you buy some gold and sell SDRs (or the currency basket in the same ratio). By monitoring markets and intervening continually (buying and selling both gold and SDRs) with open market operations in gold and currencies, you can maintain the peg. The peg is artificially being maintained. These are the only entities with enough gold and SDRs to be able to conduct the open market operations needed to peg the price. The U.S. Treasury and ECB can be eliminated because they’re relatively transparent about their total gold holdings, and if they were buying and selling gold and SDRs it would be in their official reports. Not in the reports so it’s not them. That leaves SAFE and the IMF. China has about 2,000 tons of gold (probably much more, but they don’t disclose the excess) and has been buying SDRs in secondary market trading on top of the official allocations to IMF members. The IMF has about 1,000 tons of gold and can print all the SDRs it wants with its SDR printing press. The IMF also makes loans and receives principal and interest in SDRs. The SDRs can also be traded through the IMF’s secret trading desk. For example, the IMF is preparing to bail out Argentina. The IMF loans will be in SDRs. Argentina needs U.S. dollars to defend its currency so they’ll have to swap their new SDRs for dollars. China will be a willing swap, selling their U.S. dollars for SDRs, through the IMF’s secret trading desk. That’s how China can acquire more SDRs than its IMF allocation permits. The gold can be traded secretly through the Bank for International Settlements (BIS). China can also buy or sell gold for yuan or dollars on the open market in Shanghai and London and separately buy or sell SDRs for dollars or yuan. China can also buy or sell the SDR basket of currencies separately (in the same ratio as the basket) as a synthetic SDR to manipulate the price of the actual SDR. For years people have said China was acquiring gold in anticipation of a new gold-backed yuan. Jim doesn’t agree because China does not have a good rule of law. The yuan lacks the kind of deep liquid bond markets, primary dealers, repo facilities, futures contracts and other legal infrastructure needed to be a major reserve currency with or without gold backing. The yuan is a decade or more from becoming a major reserve currency. In short, the SDR has been pegged to gold. It is pegged through manipulation. This is highly ironic. When the SDR was created in 1969 it was originally pegged to gold and defined as a weight in gold (SDR1 = 0.88867 grams of gold). That peg was abandoned just as the dollar peg (USD1 = 1/35th ounce of gold) was also abandoned. This peg to gold is informal so it can be abandoned at any time. It probably will be abandoned because the price is too low. In 1925, the U.K. returned pounds sterling to the gold standard at the wrong price, which brought on catastrophic deflation and led to the Great Depression. The peg of SDR900 is far too cheap to be sustainable given the scarce supply of gold and the growing supply of SDRs. The IMF is going to have to print trillions of SDRs in the next global financial crisis, which will prove highly inflationary. This new peg isn’t sustainable because the price is wrong. But it shows that China is betting on the SDR and gold as a new world reserve currency, not the yuan or the U.S. dollar. The whole world is heading towards gold. There was a GMR (Global Monetary Reset) in 1914 when the world went off the gold standard to fight World War I. There was another GMR in 1944 towards the end of WWII when they came up with the Bretton Woods system. Another GMR happened in 1971 when President Nixon suspended gold redemption. That’s one reset every 35 or so years. It’s been 47 years since the last one. We’re probably overdue and the system is currently unstable. Gold will play a role in a new system, as you can see with the nations buying gold consistently over the last number of years. Gold is at $1,256.60 U.S. per ounce via Kitco. I was on a trek into Saskatoon at the end of last winter to honour Joni Mitchell. There was nothing of her there. No mention anywhere. And now the promenade I was standing on was named in her honour. Joni is part of Canadian culture and world musical culture. Brilliant lyrics and lovely chord structures. A snapshot of the world at that time and all time. My thoughts on the new gold standard issue is that I don’t like jumping to conclusions on who has done what just because there is a “what”. There’s a correlation. But there may be others as well. There are many actors in this power game I call Coins and Crowns. The ones we hear of on the mainstream media aren’t the only ones out there. The thing about power is that it can move pieces which then in turn can move other pieces. I have a feeling the ones we see moving have been set in motion by larger, more stealth actors. All part of the game. I’m currently in Kelowna, British Columbia close to the Gold Rush Trail. Working away. Loving the space. Trying to learn a thing or three. Doing my best to make it easier for me to see. The packaging for the Wild Gold pendant is nearing completion. I designed it using Fibonacci ratios, recycled ethically sourced paper, linen, and raw, pure and unrefined gold, ethically sourced, beautiful right from the rivers of the Canadian Gold Rush Trail. I care about the miners, artisan, ethically paid, and the beautiful environment it all happens in. And I care about the symbolism and science of gold. Enduring value. 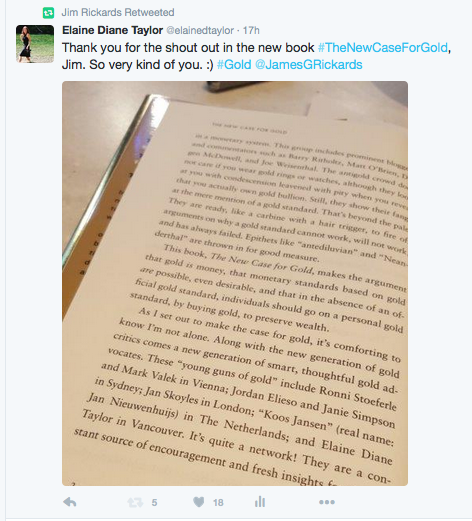 Thank you to Jim Rickards for the shout out in his bestselling book The New Case for Gold.